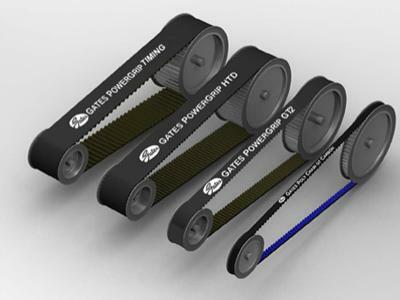 The Poly Chain® GT Carbon™ is the new polyurethane synchronous belt by Gates, manufactured with patented carbon tensile cord and providing a high torque and low speed drives. Engineers from the materials development department of Gates are the pioneer in high fatigue-resisting carbon fibre tensile cord incorporated into a new polyurethane compound belt. 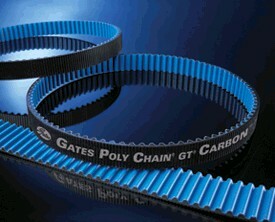 Then the Poly Chain® GT Carbon™ is the most potent synchronous belt in the transmission world, and provide a maintenance-free, energy saving and eco-friendly operation. It is a brilliant substitute to roller chain and gear drives. The construction consists of an elaboration tough and lightweight polyurethane compound. It is resistant face to chemist products and provides the best adhesion with carbon traction cords. The new curvilinear tooth profile ameliorates stress distribution and permits higher overall loading. The special polyurethane material brings excellent oil and heat resistance, ensuring a problem-free operation in oil and high temperatures areas ranging up to 120°C (applicable for transfer cases, gear boxes…). 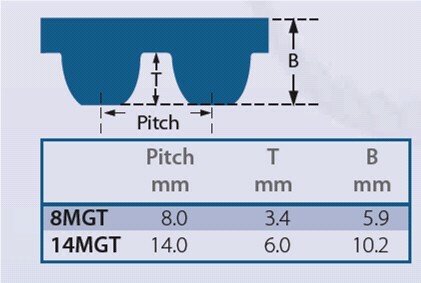 High power capacity: at least a quarter higher power than a Poly Chain® GT2. A stable virtual belt tension during all belt’s lifetime. Created to work with standard Poly Chain® GT pulleys. Usable for temperatures from -54°C to +85°C. A different version can be used to 140°C.